These Umbrella Plants are so easily re-propagated! A single plant can provide material to last many many years. A lifetime, so to speak, as it suckers rather rapidly, forming dense clusters effortlessly. 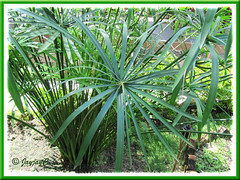 Check on Umbrella Plant profile here, if you’re interested. By dividing the clumps or root ball. Wherever possible, remove the dead crown within the divisions before replanting them. This is by far the quickest and easiest method. John and I normally choose this method as it’s an opportunity to spring-clean, repot and rejuvenate our pot-bound plants! By germinating seeds, if available. 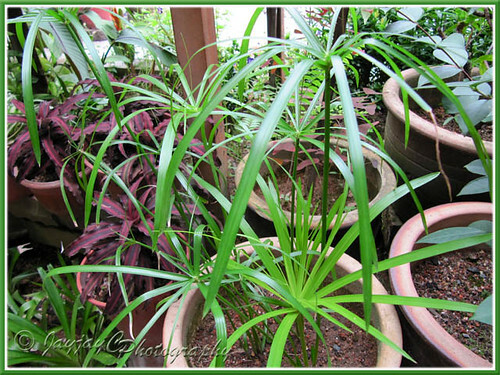 Umbrella Plant self-sows readily too. 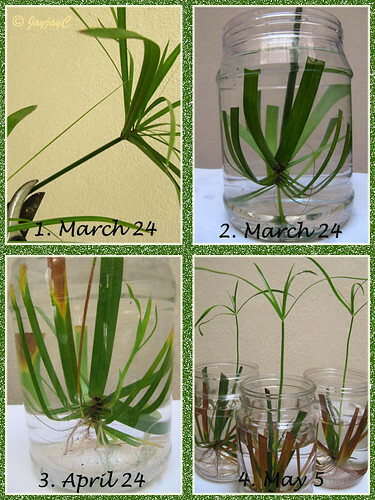 By tip cuttings. Either inverse them in a bottle/tray of water or plant directly on soil in a pot or ground. By bending down the tip end of a stem with its leaf bracts pinned down into the moistened soil. With regular watering, a new plant will eventually emerge within a few weeks from beneath. Cut off a whole stem from the plant. Then, take only the tip cutting of about 10cm long and shorten the length of the leaf bracts as well. 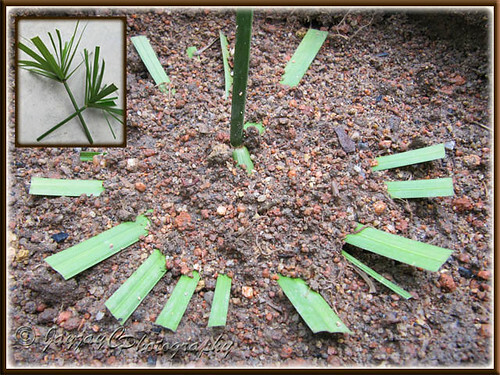 Plant the tip cutting upside down in moistened potting medium. Push it down and cover with soil. Place it at a sunny spot and with regular watering, a new plant should emerge within a month or so. Cut off a whole stem from the plant. Then, take only the tip cutting of about 10-15cm long and shorten the length of the leaves as well. Invert with its head plunge into a bottle or tray of water. Site it at a sunny spot (to maintain warm temperature for best result) and roots will form at the center of the ‘upside-down umbrella’ and eventually a new plant will emerge and grow upward in about a month. You can then plant it in potting medium – carefully snip off the old leaves of the tip cutting, being mindful not to damage the newly-formed roots and plant the new plant, either in a pot or in the ground. Best if plant can get morning sun or filtered sunlight for optimum growth. 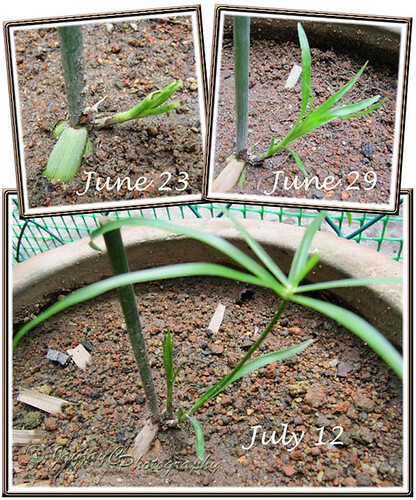 This photo below illustrates how the plants are faring on July 12, more than 3 months later. Enjoy…hope the tips have been useful! There is no need to put the the top upside down in water or soil. Putting it right side up in a glass of water with the top of the leaves exposed works just fine. I also found doing it this way with the leaves exposed speeds up the process and i get roots and new shoots in 1 or 2 weeks instead of a month or 2. Thank you so much for this new insight, TallMike! Will definitely try this out! Wonderful instructions! Have had ponds for many years now and this is one of my favorite plants. I always bend the stem with seeds on it into the water and get 3-5 plants coming from the water ready to peel off and pot up. Will try your method as well.Thanks. Thanks for the compliment, Mari. We appreciate and thank you for taking the trouble to share your method… now interested gardeners have more choices about propagating the Umbrella Plant. I was very pleased to get info on how to propogate Papyruses, something I’ve wanted to know for years. Thanks a bunch! Looking forward to addition information-as I’m fairly new to gardening, I’ve found that I have a good instict and feel for it but am ALWAYS open to new information as well as good tips, such as care, maintenance, watering, etc. Speaking of watering, I’m in SoCal, therefore I have converted most thirst plants to drought-tolerent. 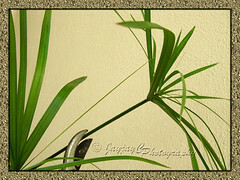 I have a very old papyrus/ umbrella plant that was my grandmothers. I have neglected it over the last few years, I used to divide and repot it at least every two years. Well, it is alive but has stopped sending up new shoots/ growth. Do you think it can be saved? It needs divided, new soil, fresh water… it is not happy. I’ve had this plant since 1992 and she was given it in the 70’s!